London is Bita's dad. He lives in Pennsylvania with his human family and his grandson (Rumble's brother), "Noah." Rumble's brother and littermate, "Noah"
Noah lives in Pennsylvania with Rumble's Grandfather, "London"
Rumble's brother and littermate, "Ranger"
Ranger lives in Northern Virginia. Rumble's sister and littermate, "Gini"
Gini lives in New York. Gini was named after the state of Virginia in which she, Rumble, and all their brothers and sisters were born. Rumble's sister, littermate, and best friend "Chili"
Chili on 1/23/03 with her newborn puppies. Chili lives with Rumble's family in Nelson County, Virginia. Mystic (one of Chili's puppies) at 3 months wearing a green ribbon for her uncle Rumble. Mystic lives in Ohio. Rhodie the cat lives in Pennsylvania. Charlie (left) and Nunzio ("Nunie") (right) live in Pennsylvania. Lexie is 17 months old and always wears a green ribbon for Rumble. She lives in Rhode Island. Coffee is 3-1/2 months old and lives in Florida. Remington is in Virginia, and he is proudly wearing his green ribbon for Rumble. Shadow is one of Rumble's best friends and is a member of our family too. Kelsey is in Virginia. Her green ribbon didn't last long, so here she is wearing a green bandana for Rumble instead. 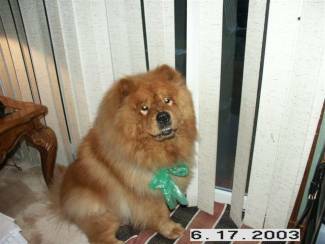 Kimba, in Tennessee, was lost on 12/14/02 and found on 12/21/02 with the help of Rumble's friends. 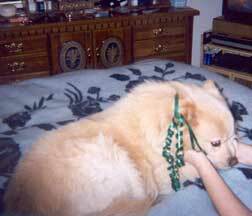 She is proudly wearing a green and white ribbon - green for Rumble and white for the miracle of being found. Cheyenne, a Shiloh Shepherd in Virginia, selected a green tag as a permanent reminder of Rumble. She is not directly related to Rumble, though shares some similarities. 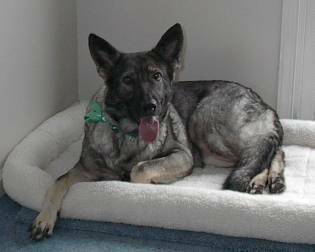 Ty, a Shiloh Shepherd in New York, is wearing his green ribbon (complete with tassel) for Rumble. Cabo (lying down) and Lucas (sitting) in Idaho wearing their translucent green ribbons for Rumble. Bear, a Shiloh Shepherd in New York, is wearing his green ribbon for Rumble. Misty is in Pennsylvania and she's wearing her green ribbon for Rumble. Another photo of Misty in Pennsylvania wearing her green ribbon for Rumble. She's also enjoying her new bed. BJ, who lives in Virginia, is wearing a green ribbon for Rumble. 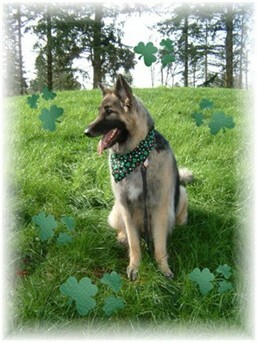 Lily, a Shiloh Shepherd who lives in Washington State, is wearing a green bandana for Rumble and sending him lots of luck. 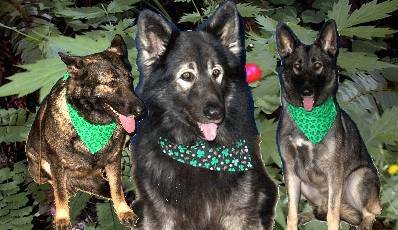 A lovely collage photo of three majestic Shiloh Shepherds in Odessa, TX wearing green bandanas for Rumble. Bear is a rescued Chow owned by friends of Rumble's extended family. These Friends of Rumble live in Virginia.